APM Hand over ‘appreciation’ money to three clans in Elikobel District. 01/03/2013 The Keijai ,Wonijai and Kewamijai clans from Kampung Bupul have each recieved ‘tali asih’ money by by PT Agrinusa Persada Mulia, a phrase which roughly translates as a ‘sign of appreciation’. The three clans were given cash as a mark of the company’s empathy and its responsible attitude to using the customary land. The Kewamijai clan were paid Rp 10,174,500, the Wonijai clan Rp 53,620,000 and the Keijai clan were paid Rp 620,921,000 at the Elikobel Districk offices, on Thursday 28th February 2013. This is the second phase of donation of ‘tali asih’; the first already took place in Muting District last year. The transfer was carried out by Dr M. Recky Teurupun M.Si, Second Assistant of the Merauke Regency Secretariat, accompanied by the head of PT APM Merauke Gazali Arief. Present as witnesses were the District Military Commander 1707/Merauke Letkol INF Dedi Hardono and Infantry Batallion Commander 726/TML Mayor INF Setyono as well as leaders of government agencies and prominent local society members. The head of Elikobel District Sabania Ladai reminded the people that when they received this money they should spend it in a wise and appropriate way. He also expressed the hope that the money would be shared out in a fair way to all who had a right to it, to avoid inter-family conflict in the future. “Don’t let it get to the point where sharing this money between families becomes a source of conflict. This has to be avoided, and that means that before the money is handed over clan members should meet together to decide how it can shared out fairly,” he said. Meanwhile Gazali Arief, the leader of PT AMS stated, although the ‘appreciation’ money had been given, when PT AMS’s land clearing operations started, the people would still be able to sell the wood to increase their economic security. “The company will stick to our commitment not to make a single Rupiah from the wood that we fell”, he stated. He continued by noting that the company’s corporate social responsibility actions in Muting have caused some feelings of resentment amongst the indigenous community, as the company has focussed its energy on building schools in Muting. However, Gazali reaffirmed that this educational year, the company would not forget about the children of Bupul, and would even hand out scholarships. “We have to pay attention to these children because they will become the next generation that will continue to develop this area,” he said. 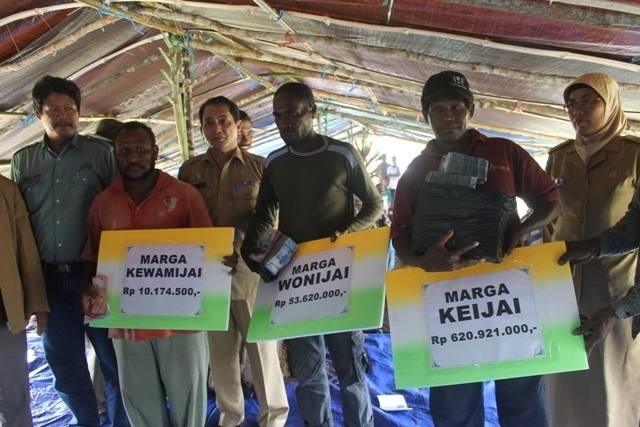 Representing the Merauke Regency Government, Second Assistant Dr. M. Recky Terurupun took the opportunity to express his hope that the three clans receiving this money would use it in ways which would benefit them, and that they wouldn’t let the money get spent in a moment for short-term desires, which would only bring difficulties in the future. “Don’t go saying that we should use the money we have today because when we need it tomorrow we can just try to find more. This is a misguided principle which shouldn’t be followed. We should use the money wisely so that it can really benefit us and our children”, he explained. This entry was posted in Merauke News and tagged AMS Plantations, Bupul, Elikobel, Ganda Group, Land Grabbing, PT Agrinusa Persada Mulia, Wilmar. Bookmark the permalink. Comments are closed, but you can leave a trackback: Trackback URL.